The first few weeks of October found us experiencing the vacation of a lifetime in Spain with the first half of this remarkable trip spent in Barcelona. 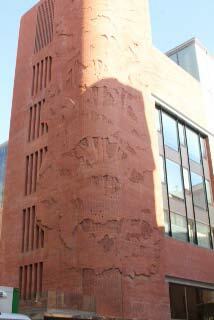 His Palau de la Musica Catalana was located near where we stayed and we found it by chance. We were so astounded by the exterior that we signed up for the guided tour and took this video during that visit. The building is one of amazing color, texture and light. Decorated with natural themes often in the form of applied ceramic and glass flowers and leaves, the style is so intense with color, movement and varied mediums that it is almost like being inside a kaleidoscope. I fear the impact must be overwhelming to those with subtle palettes. If one looks at the tiered ceramic layers that lead to the stained glass roof one is reminded of the Victorian décor that we recently saw at the Simpson house in Santa Barbara. Montaner’s style, while not as unrestrained as Gaudi, certainly shares Guadi’s sense of fun and sets both of their works apart from that of their contemporaries. The Palau was built between 1905 and 1908 but more recently the façade has been extended to include a Petite Palau in 2004. The new addition continues Montaner’s theme of nature but with the clever use of red brick which, ironically, was being built during the same period when Martin began designing his Hedgerow collection. 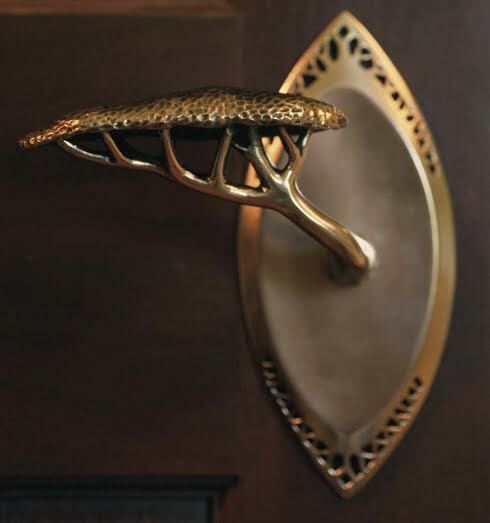 I say this is ironic as both make reference to tree canopies; in Martin Pierce’s case it is the canopy that forms the grip for the passageway door handle. This entry was posted in architectural hardware, custom hardware and tagged custom hardware, Gaudi architecture, Gaudi works, Montaner architecture, Montaner buildings, Montaner works, tree canopies in architecture, tree canopies in bespoke hardware. Bookmark the permalink.